Welcome to DaRefugees - Powered By El Diablo! Click Here to Join the discussion In our forum! Sri Lanka attacks: Authorities face scrutiny over advance warnings Reports there were warnings of possible attacks throws the spotlight on the country's leadership. Polish Judas ritual 'anti-Semitic' - Jewish congress An effigy beaten by children in a Polish town has stereotypical Jewish features. University student creates first aid kit for mental health Tina Chan developed the kit after experiencing anxiety and depression while at university in Canada. Parkinson's results beyond researchers' wildest dreams Previously housebound patients are now able to walk more freely as a result of electrical stimulation to their spines. Researchers say the small trial of the treatment has gone 'beyond their wildest dreams'. Philippines earthquake: Eight deaths reported on Luzon The magnitude 6.1 earthquake on Luzon island brought down buildings, killing at least eight. Ukraine election: Comedian Zelensky wins presidency by landslide Political novice Volodymyr Zelensky wins by a landslide as incumbent Petro Poroshenko admits defeat. Baby squirrels saved after tree holding nest is cut down Vets in Poland say two of them had been attacked by a dog before they were found. UK PM to face grassroots no-confidence vote Conservative local associations are calling for Theresa May to resign over her handling of Brexit. Algeria protests: Police 'detain top businessmen' The four are being held in connection with a corruption investigation, state TV says. UK climate protesters stage museum 'die-in' Extinction Rebellion protesters lay down underneath the blue whale skeleton in the Natural History Museum. Alopecia: I lost my hair aged one Laura Lattimore, 28, says her dozens of wigs now make her feel "mischievous and a part of me". Letter from Africa: The art of drawing your address in The Gambia With few street names in The Gambia, people have to get creative about giving directions. Violent protests erupt at Georgia's Pankisi Gorge Residents in Pankisi in north-eastern Georgia pelt police with rocks over plans for a new power plant. Tulips from the air: Artist drawn to beauty of Norfolk flowers It is their "beauty of colour and space that makes me keep coming back", artist says. Why blend? Exploring the art and science of blending Humans are the blending species, says philosopher of the senses Barry Smith, but what makes some blends work when others don't? Influencers: How a 'new breed' of social media stars changed the game How a 'new breed' of social media stars changed the game. An alternative way to capture childhood on your phone A simple, but evocative, way to record your children's development without using a camera. Earth Day: How to be more eco-friendly in everyday life It's Earth Day, so we asked green bloggers for their top tips to be more eco-friendly. The special flavour of rock�n�roll Beijing The indie bands of the Chinese capital, Beijing, have their own raw, distinctive sound, says the BBC's Stephen McDonell. Chelsea into top four after frustrating draw with Burnley Chelsea move into fourth position in the Premier League as they are held by Burnley in a thrilling game at Stamford Bridge. World number one O'Sullivan trails amateur Cahill Ronnie O'Sullivan trails amateur James Cahill after a shaky opening session in their first-round World Championship match. Norwich on brink of Premier League despite fourth successive draw Championship leaders Norwich City move to the brink of promotion to the Premier League despite their fourth straight draw. Leeds lose ground in automatic promotion race after Brentford loss Leeds United slip three points below promotion rivals Sheffield United with two games to play as they lose at Brentford. Liverpool's Milner will support Man Utd for 'first time in my life' against Man City Liverpool's James Milner will support Manchester United on Wednesday but will not watch their game against Manchester City. St Anthony's - 'Church of miracles' St Anthony's, the site of one of Sri Lanka's deadliest Easter bombings, is more than a place of worship. Sri Lanka attacks: Who are National Thowheed Jamath? The hardline Islamist group has been blamed for the Easter attacks in Sri Lanka. Three of tycoon's four children killed Danish billionaire Anders Holch Povlsen and his family were visiting Sri Lanka, where three of his four children died. Sri Lanka attacks: 'I thought we had left all this violence behind us' People caught up in the deadly Easter Sunday blasts in Sri Lanka tell the BBC what they experienced. The mental rigours of being US president Some of Mr Trump's predecessors are thought to have been depressives, bipolar and even psychopathic. 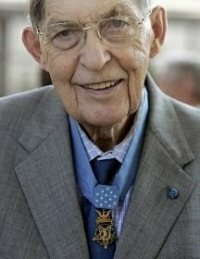 Support this Medal Of Honor Winner, Join his page, and protest the HOA!